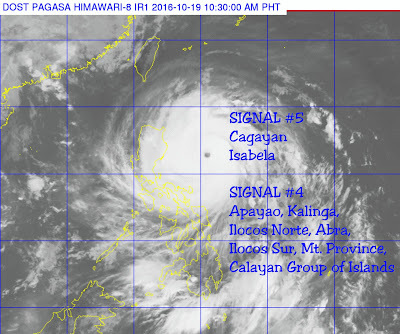 Bagyong Lawin Update, as of 2PM Wednesday, October 19, 2016: PAGASA's latest weather bulletin for Typhoon LAWIN shows that LAWIN has intensified into a super typhoon and maintained its serious threat as it continues to move closer to Cagayan and Isabela areas, where Signal No. 5 has already been raised. It's now being expected to make landfall in the aforementioned areas late this evening or early morning Thursday, Oct. 20. 9°E, maximum sustained winds of 225 kph near the center and gustiness of up to 315 kph. It's forecast to move West Northwest at 24 kph. Here's the satellite image of Bagyong Lawin as of 10:30AM Wednesday, and listed below it are the areas where tropical cyclone warning signals have been raised. LAWIN is being expected by PAGASA to exit the Philippine Area of Responsibility (PAR) by Thursday evening or Friday morning.